Century Cycles Blog: Order your maps of the Ohio to Erie Trail! Order your maps of the Ohio to Erie Trail! The Ohio to Erie Trail is a mostly off-road bicycle/hike route from the Ohio River in Cincinnati to Lake Erie in Cleveland. Now, you can obtain these brand new printed maps of the entire route! The route is divided into four sections. Each section contains detailed maps of the off-road trails and on-road routes. Each map panel is oriented with the North direction at the top of the map, and major features are repeated on each panel to make it easy to keep your place. The maps are designed to fold up and store in a typical map case, so they are easy to follow while on your bike. You can order your own copy of the Ohio to Erie Trail maps through IGotABike.com. The maps are free; you just pay $2.75 per set for shipping and handling. Click here to order. 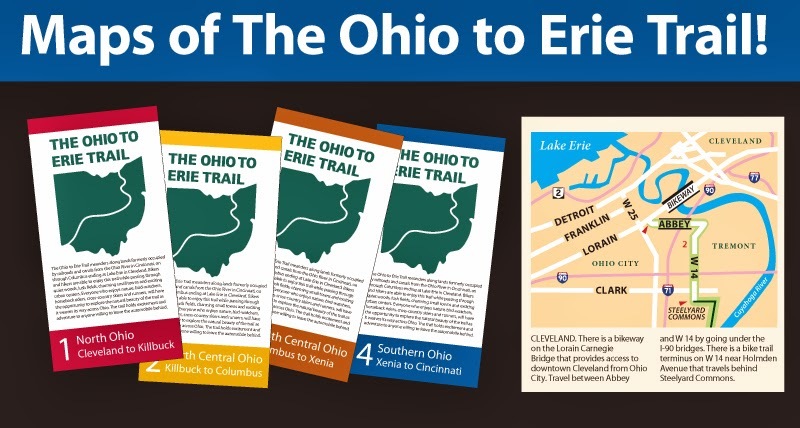 For more details about the maps, see their Tips For Reading The Ohio to Erie Trail Printed Map Panels. We've got a couple copies of each map in each Century Cycles store if you'd like to stop by and check them out! Century Cycles is hiring! Join our team! Join Team CC for the Bike MS Pedal to the Point! Giant AnyRoad bicycles now in stock! Video: One Man. One Bike. One State. See you at the Great Big Home & Garden Show! Define your life. As a young champion!